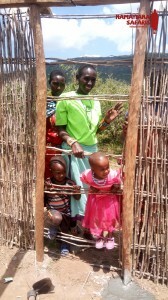 „When do you build your house here?“- a question Mpairos Family asked me all the time when I visited Kenya. And my answer was always: „Maybe next time!“. And now this „next time“ has come. 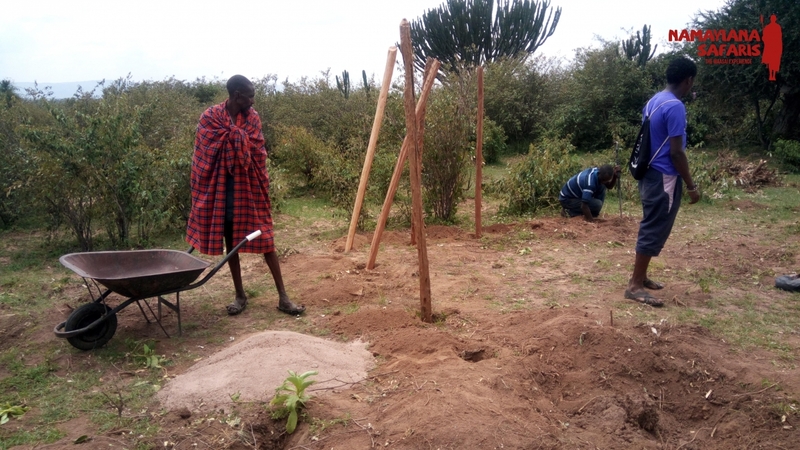 Mpairo and I decided to build a house – a typical Maasai house. 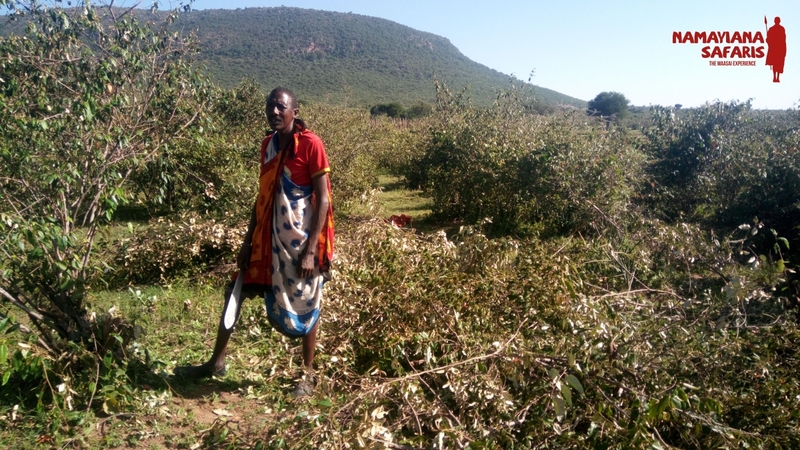 For us and for those of you, who want to stay local in a typical Maasai village and enjoy this completely different lifestyle. 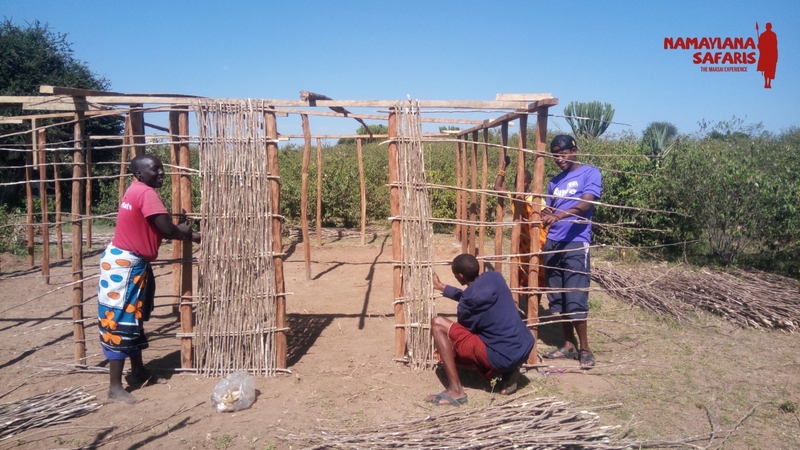 In this post you can learn how building a Maasai house really works. We knew quickly where to build our house. Mpairos uncle’s village is the place we call „home of the family“. To Ololaimutias shopping center you just walk about 15 minutes and the mountain Oldoinyo Lemeguara forms the perfect backdrop. The village itself consists of Mpairos uncle and his three wifes with children and Mpairos brother Moses, with his wife and daughter Jano. They also have fences for goat, sheep and cow and call a larged and fenced area their home. A small river is „flowing“ (it’s more groundwater you dig to) a 2 minute walk away from the houses. Also my four goats are living here. We preferred a place in the bushes, a bit hidden away from the other houses. The house will be consisting of one kitchen, a sitting/dining room and two bedrooms with large beds. We will also add a small porch to our front door, so that we can enjoy the warm evenings there. For us it was no question how to build the house itself. A modern stone house was no choice for us, we wanted to build a house that’s natural and typical of the Maasai people – just with a few modifications. We will not have a fireplace inside the house, since the smoke and ashes are not really healthy. 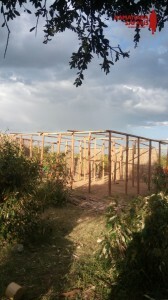 Also we will put in bigger windows for a brighter inside and have more space than in the usual Maasai house. Our floor will be cemented in order to safe our house from being eaten by termites. So far, so good. 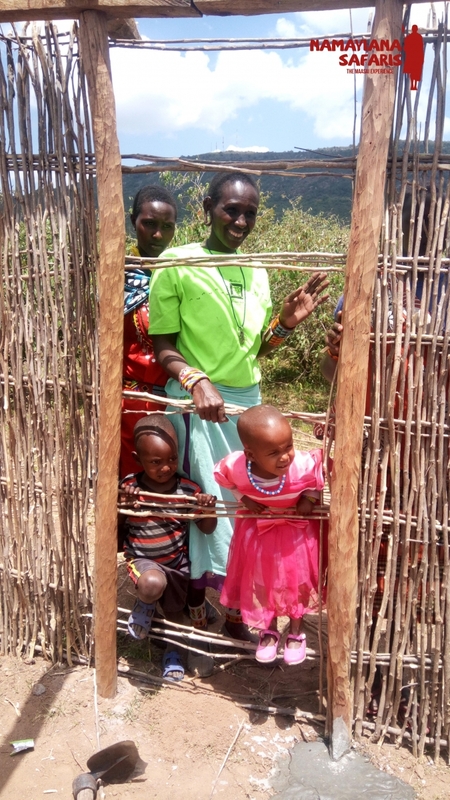 A maasai house consists nearly to 100% of natural materials. The walls are made out of cowdung and sand, the posts are found in the area itself. Everything will be done here with the work of your own hands, so it will be really exciting for me to see how this will work. 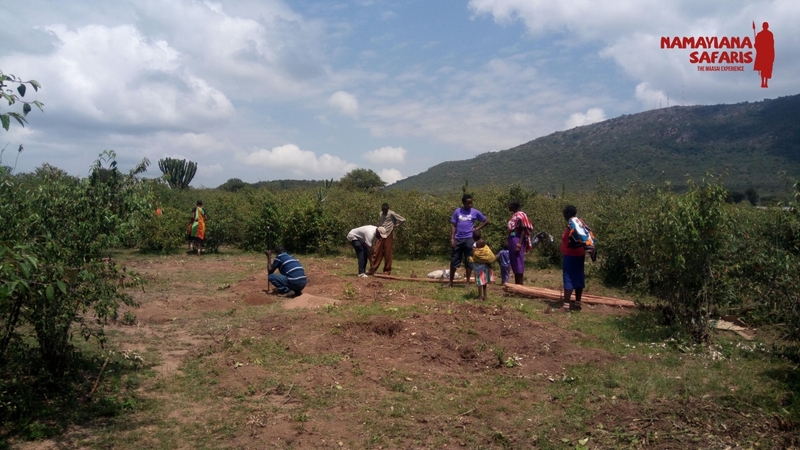 You can’t build a maasai house alone, so we tried to find the women of our family and nearby villages to help us with the construction – of course against a daily payment. We agreed on their wages and they assured us to be starting the day after tomorrow. Mpairos uncle loved our plan of building a house and he supported us with paying a friend of him to cut the bushes in the area. Perfect! He also knew of a „fundi“, who constructed his house a few years ago and we agreed with him to be starting on the day after tomorrow. So our workers were all there. Now it was time to get the materials! Tuesdays in Ololaimutia is the busiest day of the week – its market day. People come from everywhere to buy everything for one week of living. We were there first thing in the morning with Mpairos aunt Nalamala – more or less the boss of the women team. She estimated, that we would need around 40 posts to construct the house of our dreams. Nalamala knew were to get the best and cheapest ones. So we were sitting on the market in the hot sun, waiting for those ladies from far away where they cut the posts. Around us people put up their small market stalls. Lorries full of animals drove by and cars stuffed up to the roof with anything you might wish for, arrived as well. But nowhere to be seen: the ladies with the posts. It seemed like we were not supposed to be lucky today and we already headed towards the carpenter shop of the town. There you get posts of course – but not at a buying price. Anyway, we wanted to start tomorrow, so we had to buy there. Suddenly a yellow bus turned up and inside were our first 12 posts – for a good price. Some ladies saw us buying the posts on the street and they rushed to us with good news: they also have posts to sell. In the end we collected posts from everywhere in town and put them to a car that we rented for that purpose. Happy and with 40 posts and a bag of cement we returned home. The uncle’s friend did a great job, the area of our house was bush-free today. Today our „fundi“ came for making the measurements of the house and to dig in the posts. We started early morning and I showed him my drawing of the house. After one hour and Mpairo complaining the house to be not big enough, we finished marking the walls and rooms. We will build a square house of 6.5 m x 6.5 m, the rooms also being squares. After marking, the fundi dug the holes for the posts, what was a very tiring work in the hot midday sun. 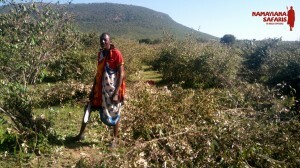 In the afternoon the ladies started to bring the woods for the walls. They cut these on Oldoinyo Lemaguara and take them down with the help of their heads. A very hard work that they have to continue for the next 5 days. In the following days we cemented the posts into the ground, cut more bushes and saw the stackings of wood growing higher and higher. We also nailed frames to the top of the posts to give the house the needed stability. 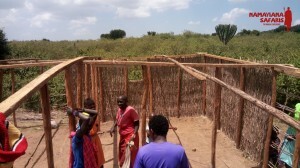 In the end we got a feeling how the maasai house will be looking like: awesome! And big! 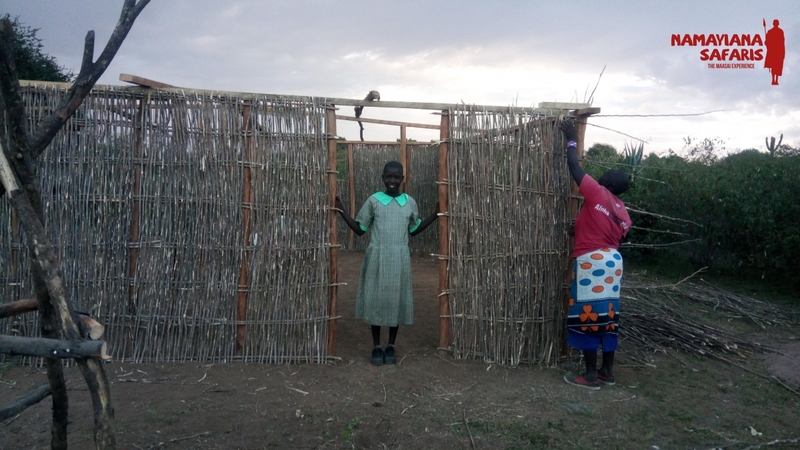 After 5 days of going to the bushes and cutting the yellow leaf crotton for our house, we could finally start with the buidling of the walls. First you fix some horizontal branches to the posts, then you start with the vertical weaving work. What seems to be quite easy, is a very exhausting work for your arms, hands and legs. But it’s also very pleasing to see the progress you make. Then you realize, that you are really building your own house with your own hands. Everything you need you just get right from the nature. A great feeling!